If you live in the fancier parts of London, Manhattan, or Los Angeles, odds are that your neighbors are not Pat and Debbie Turner. It’s more likely that they have names like Bashir Abadi or Wang Jianlin. High-end real estate is largely beyond the means of even wealthy Americans. One of the reasons for that is that $40 million-dollar apartments are being marketed and sold almost exclusively to the richest people on the planet. Some of these Masters of the Universe have kids. They do not grow up like normal people. It’s unclear who the spoiled brats that recently terrorized a posh Beverly Hills neighborhood are. What is clear is that one of the vehicles in the street race captured on video (and making the rounds on the internet) is a Ferrari that retails for about $5 million. So what did the operators have to say when the police caught up with them? 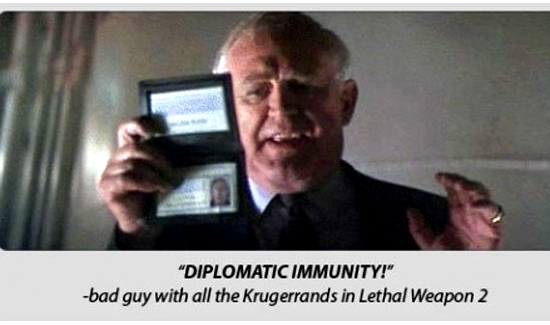 For Lethal Weapon fans, it brings to mind Krugerrands and Roger Murtaugh.